After a day without a medal, and how often in British history at World Championship can that have been a real disappointment, it was important to get back to medal winning ways, to keep up the momentum already generated this week. And that the British team did it in dramatic fashion. For several years GB’s relay teams have combined to punch above their weight when you looked at the individual rankings, but it hasn’t always brought with it medal success. That wasn’t the case again in Kazan with the men’s 4×200 team the sum of whose parts brought gold, although of course it helps when one of those parts is the individual 200m freestyle world champion. James Guy is having the meet of his dreams. He hit the water in third place, 1.63s behind the US team, but set about reeling in his prey irresistibly until he was left at the helm of the race with just metres to go and the world title was his for the taking. But while his was the pivotal contribution, his teammates had done all that was asked of them to put him in a position to strike for glory. And this is where the parts were shuffled. Few would have expected Dan Wallace to be leading off in the final, but his heats swim of 1:46.03 made him impossible to leave out. Robbie Renwick was in next, his natural tendency to get after it early tamed and a strong finish ensued as he posted 1:45.98 and keep Britain in the hunt. Next in was Calum Jarvis, shrugging off any disappointment he may have felt over his 100m heat or his 200m semi final and instead channelling his strong 200m heat swim, to record a 1:46.57 and set up Guy for the duly delivered coup de grace. But however well the swimmers did, and they deserve every plaudit they receive, extending also to the heat swimmers Nick Grainger and Duncan Scott who ensured Britain qualified safely, the coaches deserve significant praise also. They got the tactics spot on, perhaps anticipating that the US would front load their team and opting instead to back end theirs such that arch racer Guy would be the greyhound to the US rabbit. They also got the team in the mindset to swim their own race, not to over swim the first 100m, so easy to do when chasing, and to finish each leg strongly. This was truly a team performance that added up to more than the sum of its parts, even though many of those parts weren’t even in the pool. If you are looking for consistent international performers look no further than Andrew Willis who has featured in every major final contested since the Commonwealth Games of 2010. He was at it again in Kazan, as he took his place in the final of the 200m breaststroke, recording a season’s best but coming up just short of the podium in 4th. That repeated his agonising finish from the Barcelona world championships of 2013. Sometimes though consistency isn’t enough, especially in this bold new world of GB swimming, and the man himself must be getting tired of fourth places. 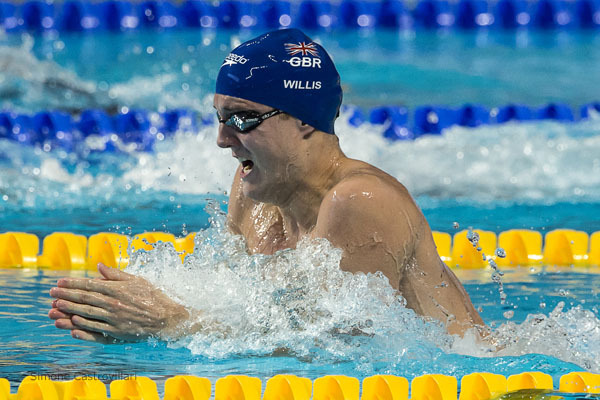 Willis was only a fraction off his PB, but needs just to push on a touch more. He’s now finished his degree studies in Chemical Engineering so perhaps that will give him the boost he needs; after all if he wants to keep up his run and be in the Rio final in 12 months time, he’s first got to get through a GB selection procedure which promises to be just as tough as getting to the Olympic final. Andrew Willis’ 4th place in Barcelona was one of the better performances of 2013, in a championship that was wholly underwhelming for Britain. This time round it almost barely merits mention. 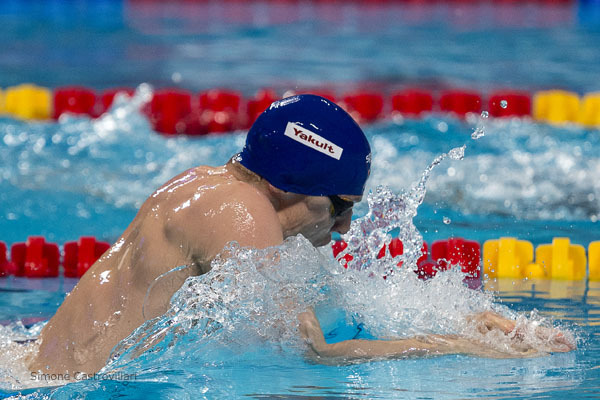 Dan Wallace summed the change in fortunes up most appositely after his 200IM fourth place when he said that it would have been one of the best of performances 2 year ago but this time round was little more than mediocre. That despite him setting three Scottish records on his way to fourth in the world in his less favoured event. It’s that cumulative swelling of belief and raising of sights that has been so impressive in Kazan as Britain sits at the high end of the medal table with a lofty 5 gold medals and eight in all, matching their record hauls of 1975 and 2003. In deference to those earlier teams, one should note that there were no mixed relays for them to contest, and in 1975 no form 50’s either, but it seems most likely that the current crop will be adding further medals on the last two days of competition. What a change from 2013 when they were adding their only medal on the last day.